The LeapStart interactive learning system is designed to help build key skills and challenge kids to get ready for their next step in learning. Get kids excited about everything from counting to creativity, phonics to problem solving, and shapes to social skills with replayable activity books bursting with fun on every page. Open up a world filled with robots, tools and gadgets galore with this fun-filled, interactive STEM activity book for LeapStart – the interactive learning system designed to get your child ready for school and life. 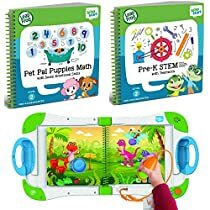 LeapFrog LeapStart Pre-K STEM (Science, Technology, Engineering and Math) with Teamwork Activity Book is jam-packed with over 40 replayable activities that engage kids ages three to five at the pre-kindergarten level to keep them playing and learning for hours.LeapFrog LeapStart Pet Pal Puppies Math with Social Emotional Skills Activity Book is jam-packed with over 40 replayable activities that engage kids ages three to five at the pre-kindergarten level to keep them playing and learning for hours.